With ClickBank Feeds tool you can search for targeted ClickBank products using your keywords. Search results will be combined into a self-updating content feed which will show all latest ClickBank products related to your search. ClickBank feeds are Private content feeds. The number of active Private feeds may be a subject to limitations at RSS Ground membership plans. Before you start using ClickBank Feeds tool you need to sign up to ClickBank affiliate program. See quick guide. 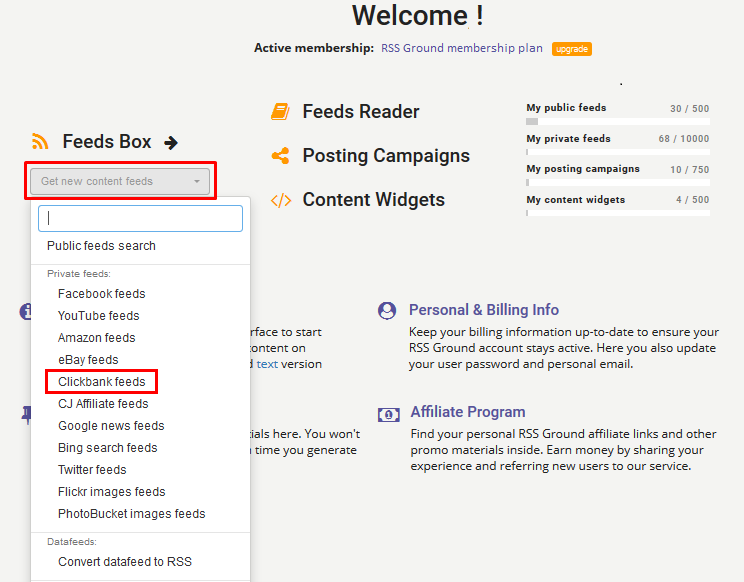 If you already have RSS Ground account find ClickBank Feeds link in the main menu. 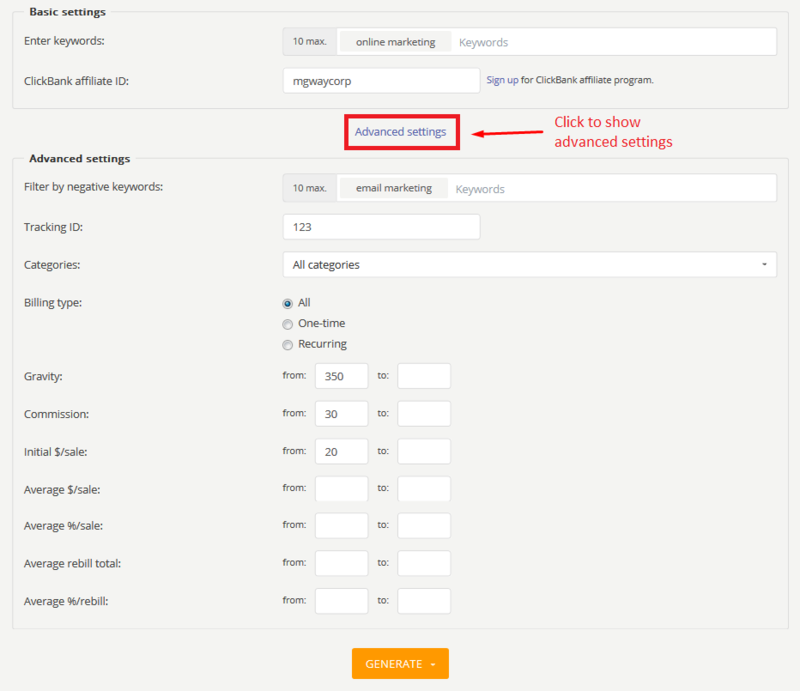 ClickBank Feeds tool has Basic and Advanced settings. Advanced settings are optional and are used for a specialized search. At the same time, basic settings are quite enough to search for targeted and quality eBay products. Use Setup posting campaign option to start sharing content from ClickBank feeds right away. Whatever option you choose your new ClickBank feeds will be saved to your Feeds Box anyway. We will generate a separate ClickBank content feed for each of the specified search keywords. To search for targeted ClickBank products you can use only Basic settings. Advanced mode settings are optional. However, here can use various filters to get highly targeted search results. Filter by negative keywords - remove products which mention specified keywords from the search result. Tracking ID - specify your code to track ClickBank links and sales. Tracking ID will be added to each product link. Learn more about ClickBank tracking ID. Categories - search for ClickBank products in a specific category. Use All categories to search the entire ClickBank product base. Billing type - filter products with one-time payment or with recurring payments. All - no matter what payment method is. Gravity - limit minimum and maximum gravity measures. Learn more about Gravity index. Commission - limit the minimum and maximum rate of commission from each sale. Initial $/sale - limit average dollar value of an initial sale, not including rebills. Average $/sale - limit average dollar value of a sale, including both initial and rebill payments. Average %/sale - limit average affiliate commission percentage for a sale, including both initial and rebill commissions. Average rebill total - limit average total dollar value of a sale, including only rebill payment. Average %/rebill - limit average affiliate commission percentage for a sale, including only the rebill commission. When you are done with all advanced settings press GENERATE button. We will generate a separate ClickBank content feed for each specified search keyword.